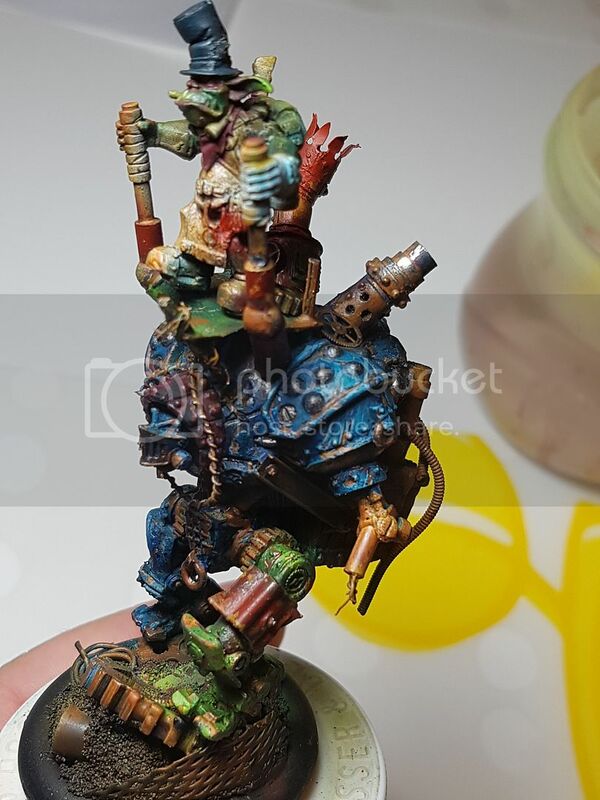 Full disclosure: This Gobber tinker is the first serious effort I have made to paint anything in nearly a year. 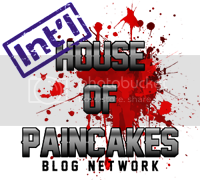 As the incredible Jessica Rich said in last weeks post, you use it or you lose it. 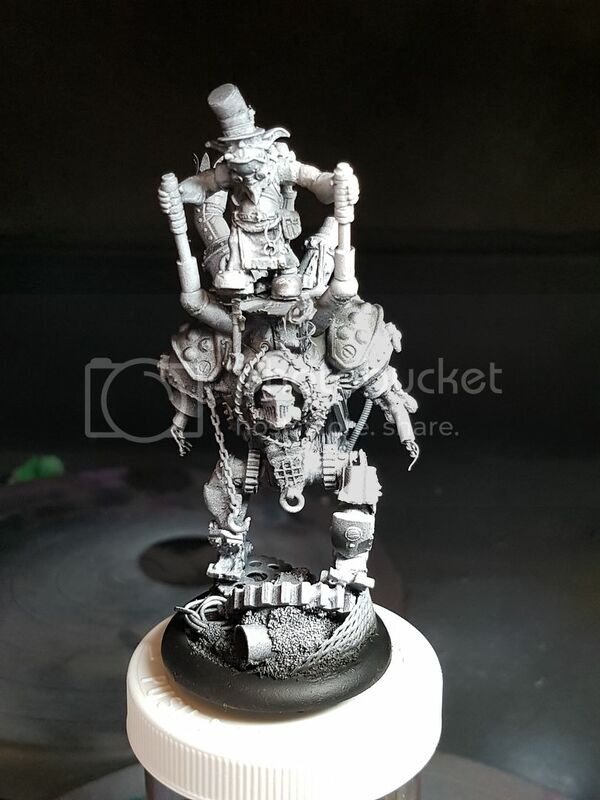 The Warjack won't be the only thing showing how rusty it is in this article. 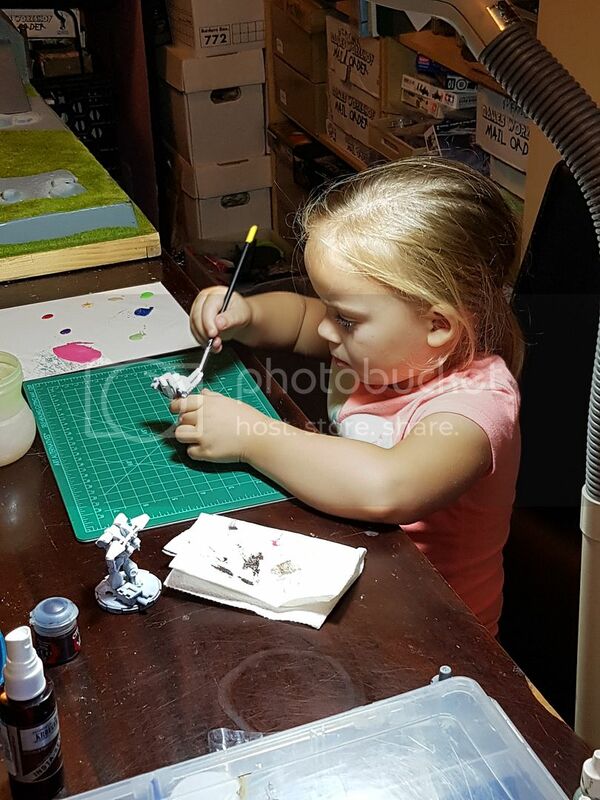 After the passing of my mother a year ago I painted up a storm immediately after and then just couldnt bring myself to sit down and focus on it for a long time..... but now? 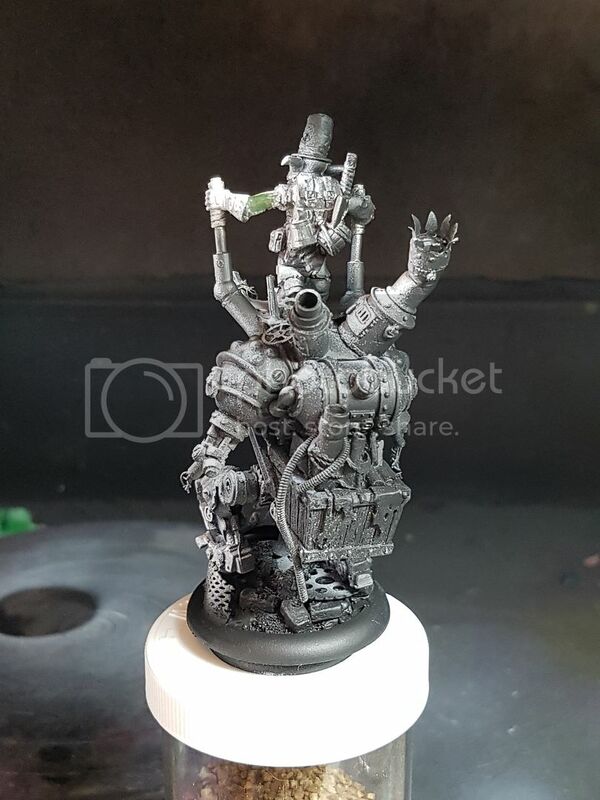 I really wanted to use lighting to give my model a sense of volume and to draw the eye upwards to the gobber himself so I started with priming in black and white - not as a full zenithal lighting but rather as an angled source that draws attention upwards and forwards. 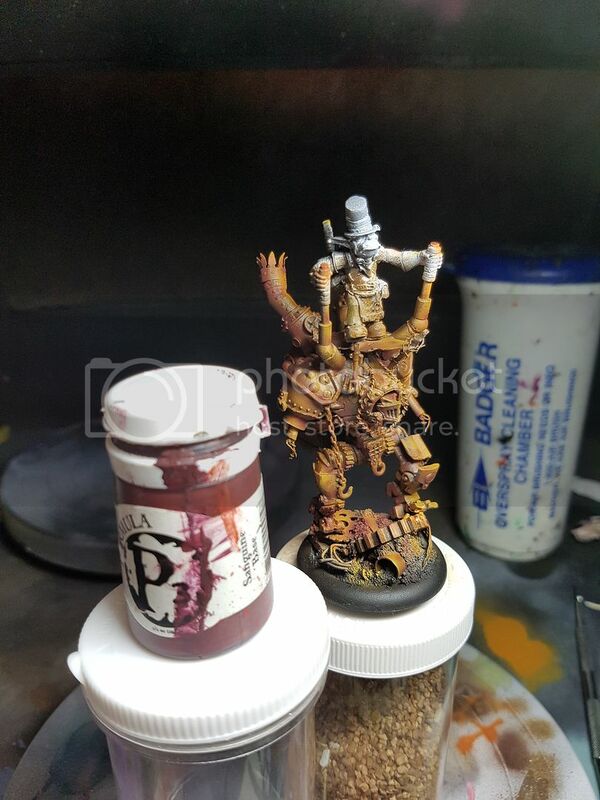 I used my ABSOLUTE FAVORITE primer in the world - Badger Stynylrez through my airbrush. 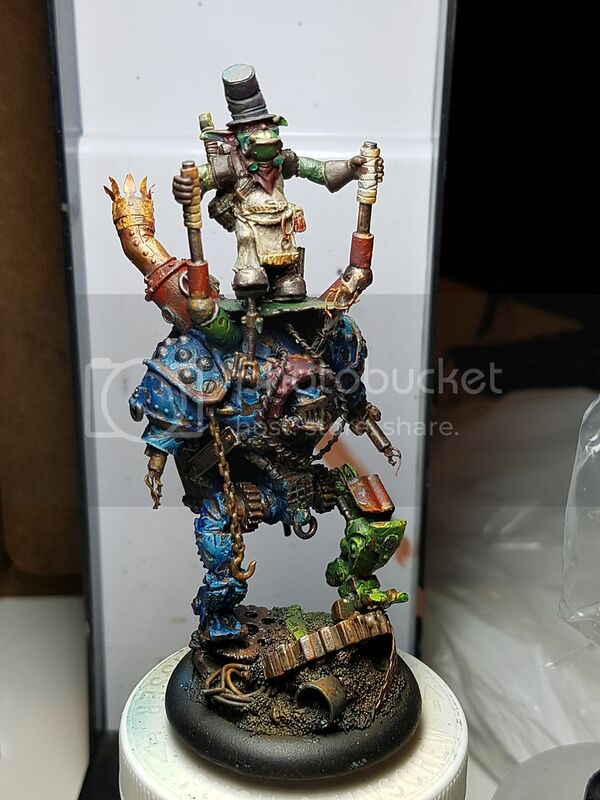 With that established it was time to begin my rust layer - This tinker didn't steal a new warjack after all - it has been bodged together from scrap and leftovers - while it may be "the big score" to someone like him, it still had to look like someone else's junk! Once the rust coat was finished I let it dry for 48 hours and then coated it liberally with AMMO by Mig Jimenez Chipping Fluid..... Then the real fun begins! 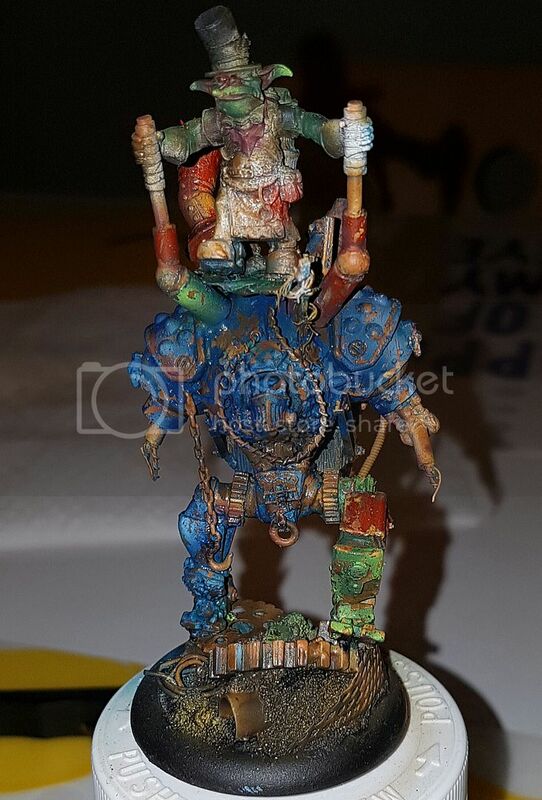 I decided that since I was using a Cygnarian Warjack as the basis of this model I would go with predominantly Blue - a colour I don't get to paint too often and that would relate well to my orange rust tones. 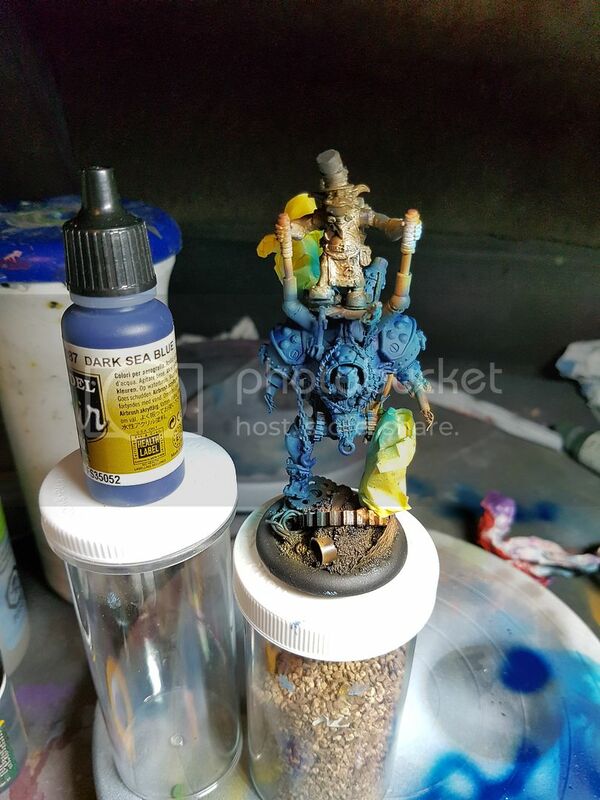 I also decided that since I was using a Mercenary jack leg I would do it in Green (P3 Green with VMC Yellow Green) to tie visually into my Merc army and since the goblin himself would be green this would help to create harmony and a stronger overall composition. Red became the spot colour in both a strong VMC Scarlet red and a desaturated red violet made with the P3 Sanguine base. 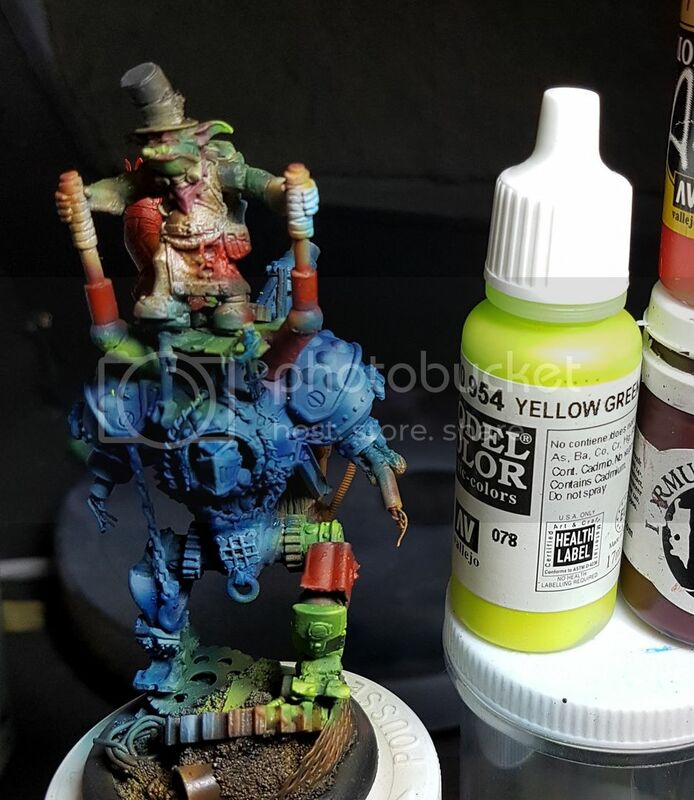 So now all the colours are laid in, but what about all that lovingly applied rusty tone? Well, this is where the fun part actually begins! 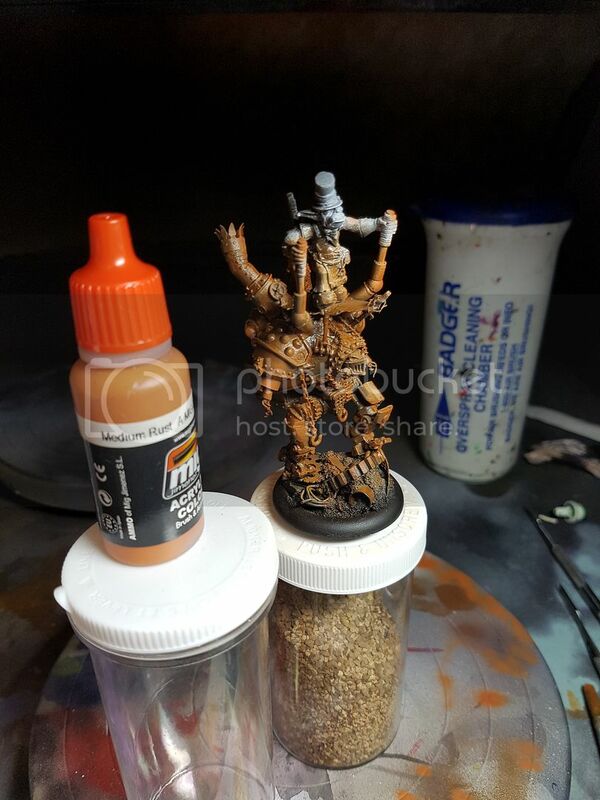 Once the paint was touch dry I grabbed a larger soft clean synthetic brush and a small container of water with just a drop of running alcohol in it. I used that to rehydrate the surface of the model one or two sections at a time. 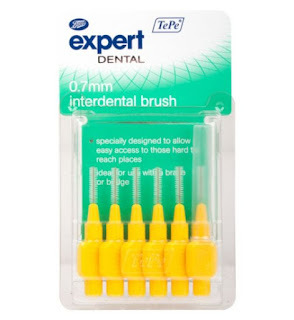 then using an older rougher brush, a dental flossing brush (also super useful for cleaning your airbrush!) and a couple of pointed implements I was able to quite literally scratch and wear through the coloured paint because of the water soluble Chipping Fluid layer I had applied over the rust and below the colour coats! 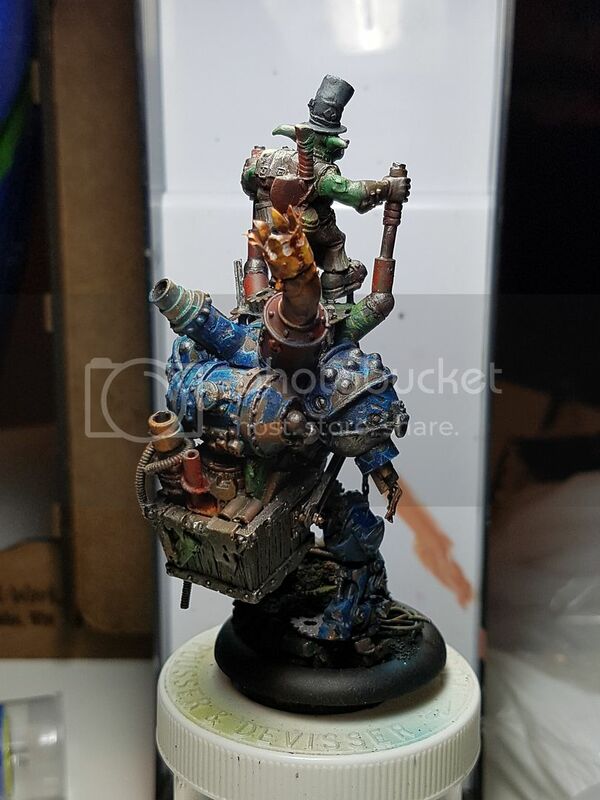 This exposes the "rust" layer beneath. Scratched, rusted and worn it now looks more like scrapped parts for a proper tinker! (and doesn't he just look smug up there!) 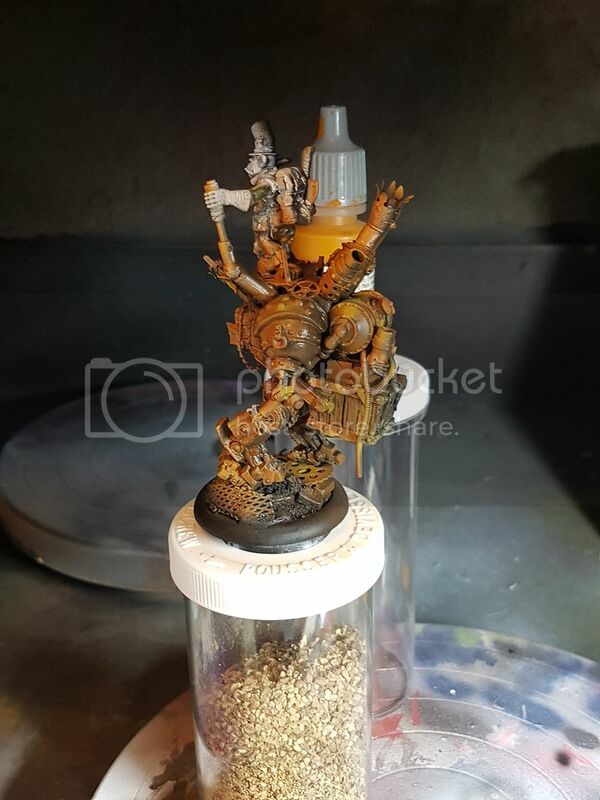 Once the model had dried fully again I dullcoated it to protect my work up to this point and to avoid and further accidental destabilization of the chipping fluid layer. 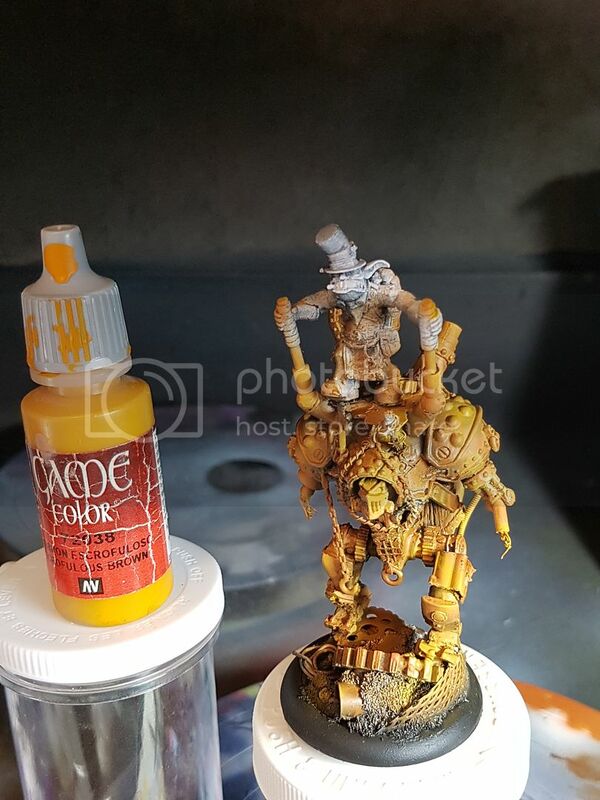 From there it was the slow painstaking process of highlighting and shadowing the edges of each paint chip and using fine glazes to build up luminosity and refine colour gradients across the major forms of the armour. 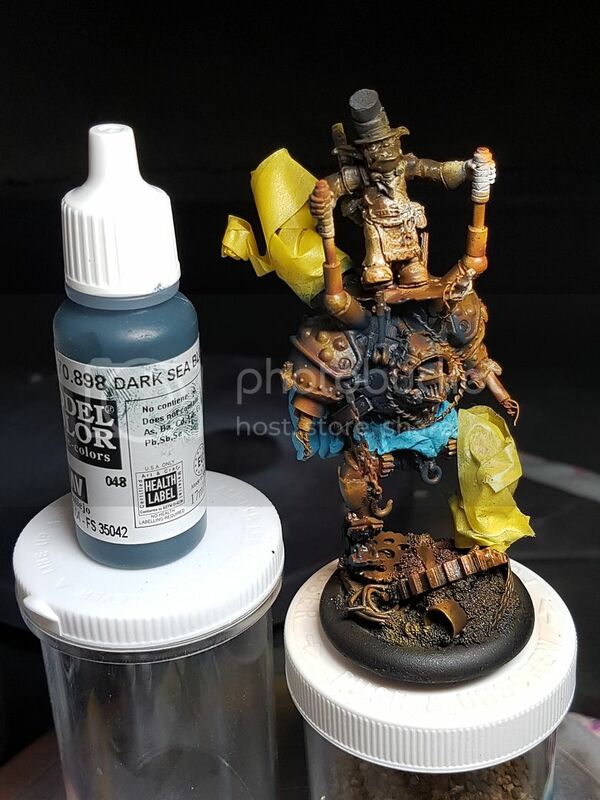 I also began to develop the metals using a combination of my new Vallejo Metal Colour Burnt Iron (thanks Fernando Ruiz for the lowdown on this stuff - it is great! 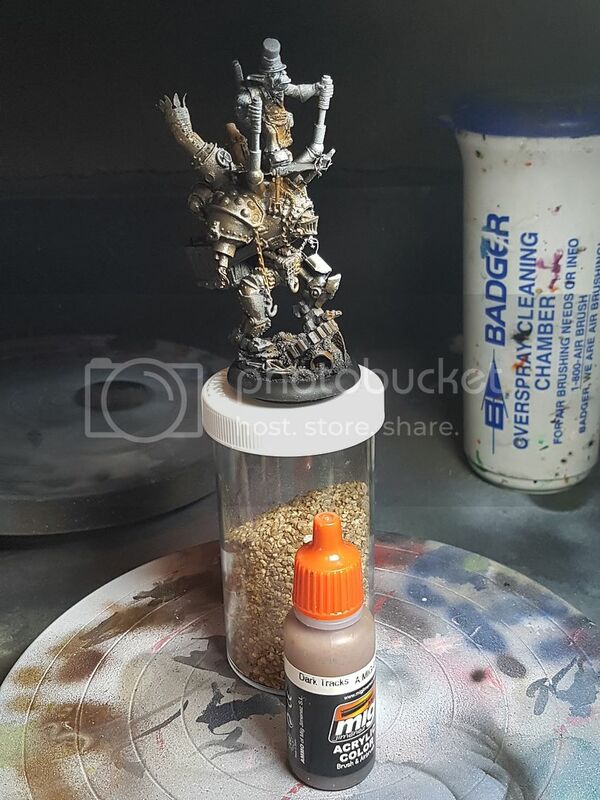 ), DarkStar Miniatures Molten Metals, Forgeworld Dark Iron Pigment, and a pencil. 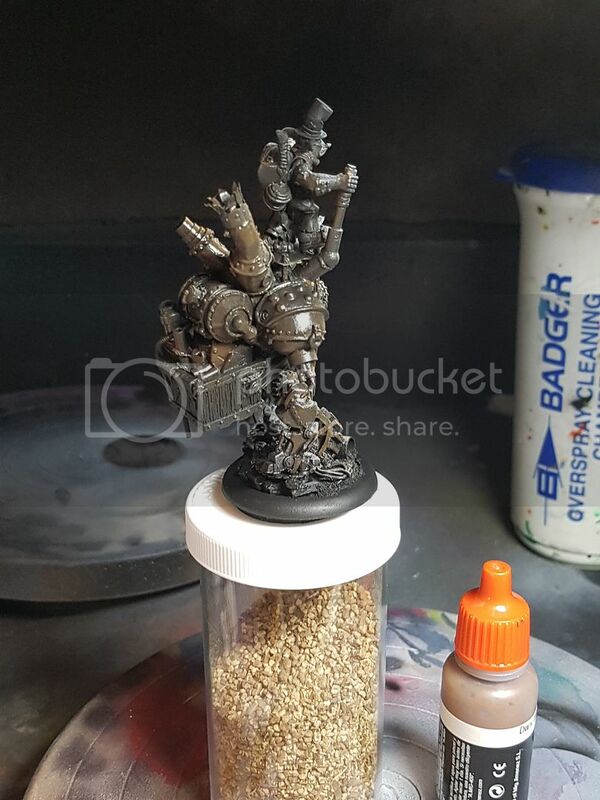 It is really noteworthy that pencils can be super helpful in weathering - from making fine scratches that are not as exposed as the big rust chips we have done to simply adding a metallic sheen to edges. It is quick, easy and can look amazing - just be brave enough to go for it! 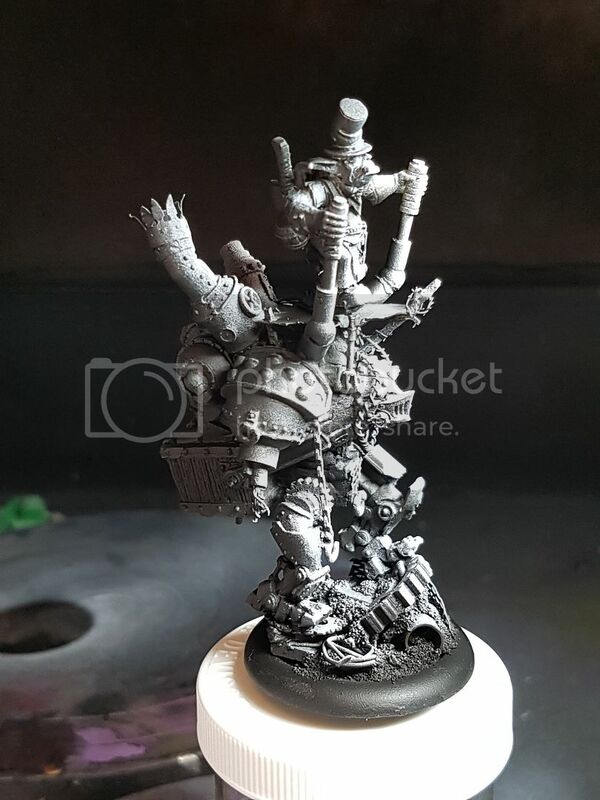 I'm going to leave off here for now because most of the interesting stuff has been done - I did have to go back and paint the goblin, stowage and to work out a few more areas, but the techniques in doing all that are either traditional or have been covered above. 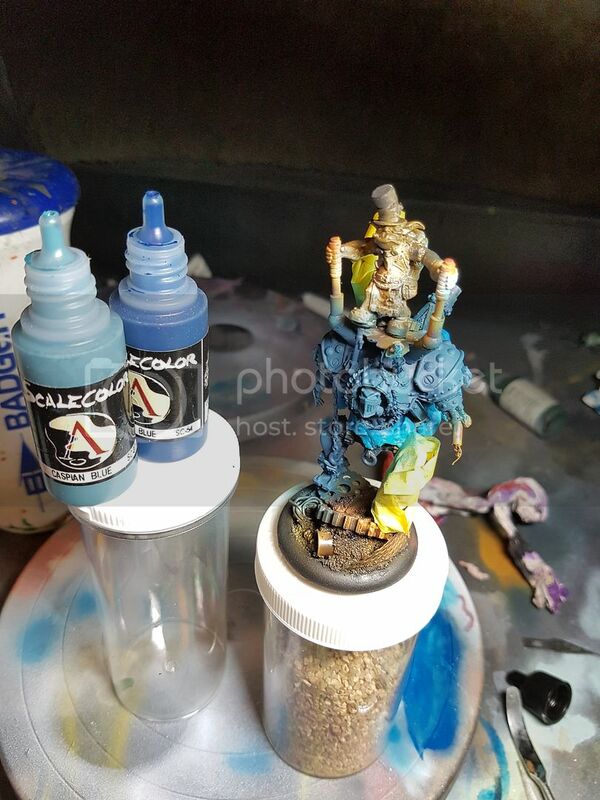 I did also break out my AMMO and stardust pigments, AMMO rust washes etc. 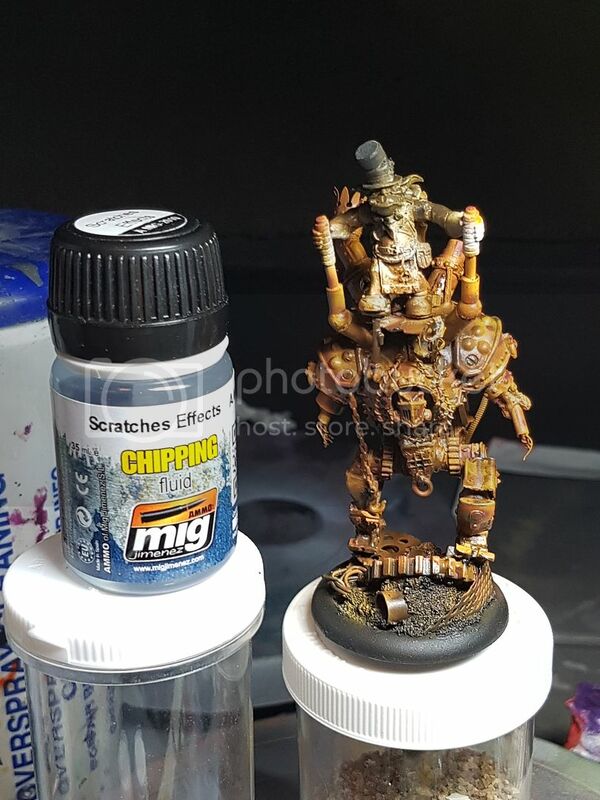 to accentuate the weathering further - Next week Ill comment on more of the finishing and post this little guy's glamour shots as a completed piece! 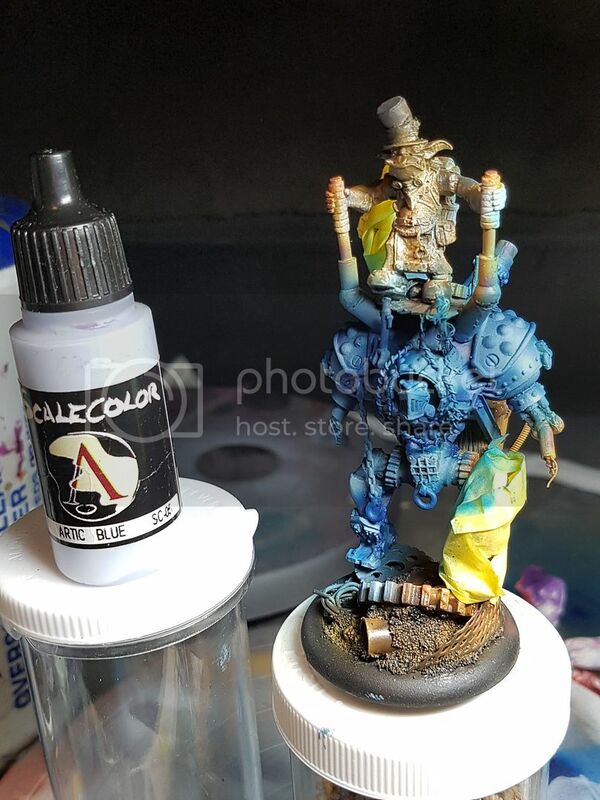 If you have any questions about colours, techniques or anything else do not hesitate to ask!